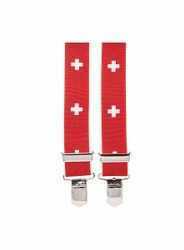 Swiss-made red suspenders with Swiss cross design. Cotton/ poly/elastic adjustable, 44” long. 2 front, 2 back clips. 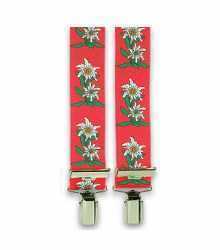 Black suspenders with a repeating alpine flower design. 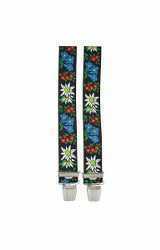 Cotton/poly/elastic adjustable, 44” long. Imported from Switzerland. 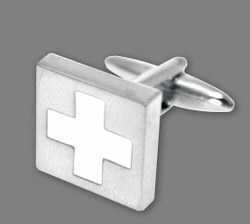 Swiss-made classic mountain farm pattern. 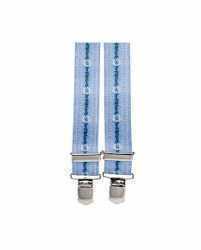 Cotton/Poly/Elastic construction 1-1/4”w adjustable length with 2 front, 2 back clips. Colors: blue or charcoal.